I have a tragic story to tell today. If you have been following me for a while, you’ve been introduced to my charming and beautiful Tuxedo cat. Tuxedo and his unrelated sister, Sunshine came into my life about 10 years ago after a very special cat died from some war wounds. 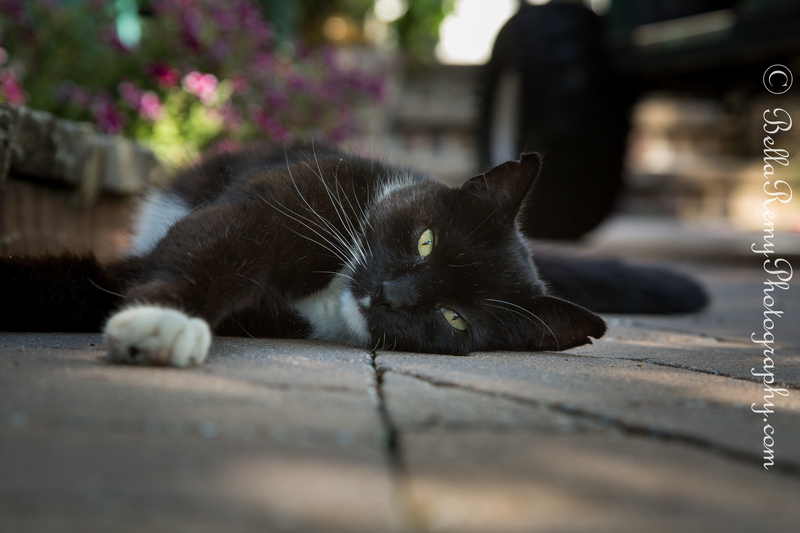 Tuxedo was a bundle of energy and was a typical teenage boy. Come in, eat and leave. Come in, sleep and leave. Rinse and repeat. He loved the great outdoors, while his sister has learned how to live in the lap of luxury inside. 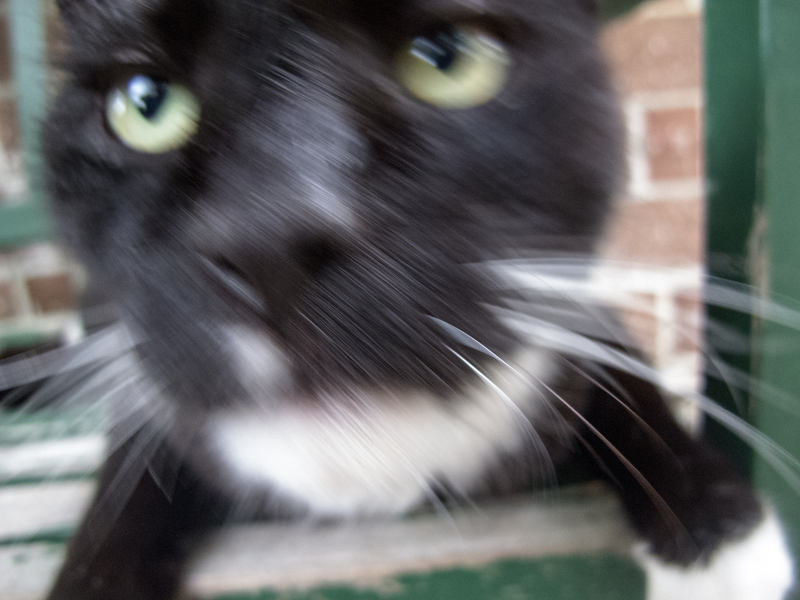 Tuxedo was a great mouser and loved to bring me gifts of dead things, howling in pride when bringing them to the kitchen door. We had a regular routine of check-in times. At 5:00pm for dinnertime, Tuxedo did not appear. Hours passed, and after walking the full property opening up doors and rooms looking for him, no Tuxedo. Finally at 11:00pm, hubby shouted outside for Tuxedo to return. About 10 minutes later, I opened up a door to look for him again and he rushed in. On three legs. The front left leg was completely swollen and the shoulder looked like it was out of its socket. I packed him into a box and rushed him to the animal ER, checked him in and found out in X-Rays that he had been shot by a BB Gun. The pellet had broken his upper leg and the pellet could still be seen. Leaving him overnight, in hopes of having it repaired this morning we prayed that all would be well. After speaking with the surgeon, and discussing a long five months of crate confinement and antibiotics, the rehab, let along the $5,000+ vet bill, we had no choice to to ask for him to be put to sleep. 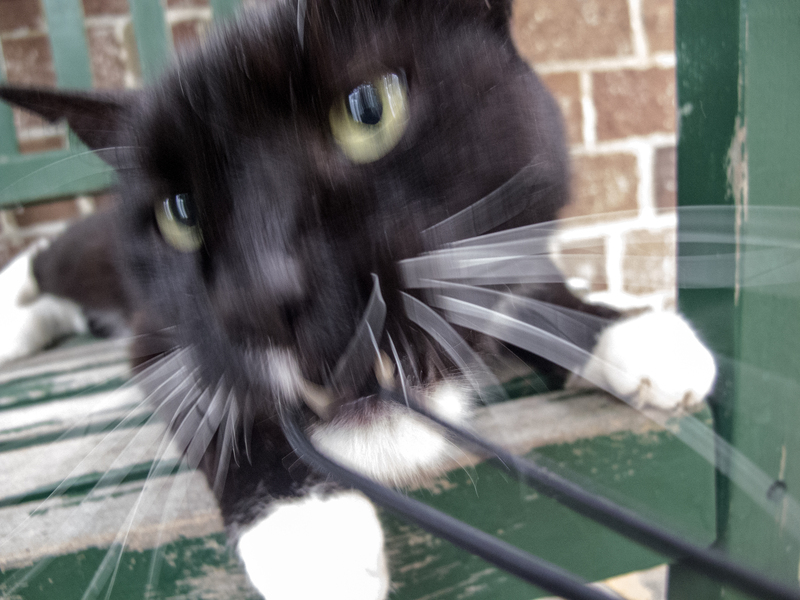 He was such a cheerful cat, and always so joyous to see me when I returned home. He looked at me with such pure love that no other has looked at me like. He loved to follow me around the yard, and even down to the boat dock. Although he used to meow and tell me to get off as it wasn’t safe. He also liked to play with me, even when I was trying to take his picture. He was truly a special cat, and his adorable face and bubbly personality will be greatly missed. I am so sorry for your loss. I get so angry when I hear about people shooting animals with BB guns. It really makes my blood boil. It sounds like he was a very special cat and had a wonderful life with you. I lost my Tuxedo last year due to kidney cancer. It is such a difficult loss. My thoughts are with you. I’m so, so sorry. How I would like to find the idiots who did this. I am so sorry for your loss and feel your pain. Our animals are only with us a short while and they are family. My thoughts are with you. Hunt them down and lock them up, I say! I suppose it could have been an accident, but really, nothing to do with guns can be classed an accident, can it? I’m so sad for your beautiful furry friend and the awful decision you’ve had to make on his behalf. Pets quickly become family members that touch our hearts and leave a void when they go. I am sorry for your loss. So sorry, Emily. Big hugs to you. And I hope they catch the psychopath who did this. I’m so sorry, Emily. Our beloved pets are part of our families. Much love and prayers to you and yours. Losing a pet under any circumstances is heartbreaking but to lose one over something like this is really awful… I’m so sorry for you and your family. Oh how sad. 😦 I can sense your devastation. Being a cat person myself I know how I would feel under similar circumstances. It’s one of the reasons I keep both my boys inside. I do hope you find joy in his memory. Be well. Oh Emily, I am so very, very sorry to hear this sad news. My thoughts are with you and your hubby – may these marvelous photos and joyous memories be a comfort as you remember Tuxedo’s life. So sorry for your loss and angry that anyone would hurt him. This is very sad Em. We have three cats and I dread one day having to make a similar decision. The first shot is a beautiful image of a beautiful puddy-cat. RIP Tuxedo. So sorry to hear this. Sadly the world is full of idiots. oh what a sad, sad story emily. i am truly sorry for your loss. losing a pet is like losing a family member. i hope those cruel and heartless people have to suffer for what they did, this makes me really angry. my thoughts are with you and tuxedo, may he rest in peace!! I can’t tell you how sorry I am for your loss. I know how awful you must be feeling as it is not that long ago that we found ourselves in similar circumstances, but with our dog Bramble, whom we still miss. I am sending lots of love and big hugs and I mourn with you. I am besides myself to think there are mean people out there that will harm a pet like that. Think of the great memories of the lil cutie. I hope you are ok.
My condolences for your loss. He looks so happy in his photos, and it sounds like he had a wonderful life with you. So sorry. Oh, I am so sorry for your loss, especially given the senseless act that lead to it. Pets hold such a special place in our hearts, and the sadness at their passing is like no other. Your selfless act of mercy in relieving him of his pain was the ultimate gift to him. So, so sorry for your loss. Tragic. It is a testament to your love and connection that Tuxedo made his way home to you and you could say goodbye. I am so sorry for your loss. I do not understand how anyone could have committed such a senseless and horrible act. My thoughts are with you. Oh my gosh, this is way too sad Emily – I’m really sorry. Cats are members of our families as well, and this tough guy was your love. I’m so happy to read that he was able to get home giving you a chance to say goodbye. Oh my darling, I am so incredibly sorry for you…. How anyone could harm such a sweet, beautiful creature — it’s beyond the scope of imagination. Sending so much love your way. Consider notifying the police that someone’s out there doing this — because it’s definitely not a one-off deal. Sadly. Beautiful tribute. So sorry for your loss. Holding you in the light and wishing you peace and happy memories of your sweet pet. So sorry to hear of your loss. This is a wonderful tribute to a fantastic cat and friend. So sorry for the loss of a dear and special furry friend. This week has been tough for me and my wife to as we lost a special furry friend as well. His name was Manson and he was a wonderful kitty. Oh no…that is terrible news. I am so sorry that you are going through this as well. I bet Manson was a true sweetheart. Hang in there. Oh he is such a handsome cat. Your photos of him give great evidence to his large personality. That is great that you have such photos of him to hold onto. Keep him alive with all these memories. He looks like he had a bit of swagger about him! Is his sister kitty holding up okay? Take care of yourself and tell all kinds of stories about him, I’m sure we all here would love to keep seeing the photos you haven’t yet shared. Oh geez, animals are weird like that. At least she’s doing okay, I think it would be even harder to watch her mope around sad and missing him. So sorry for your loss Emily.